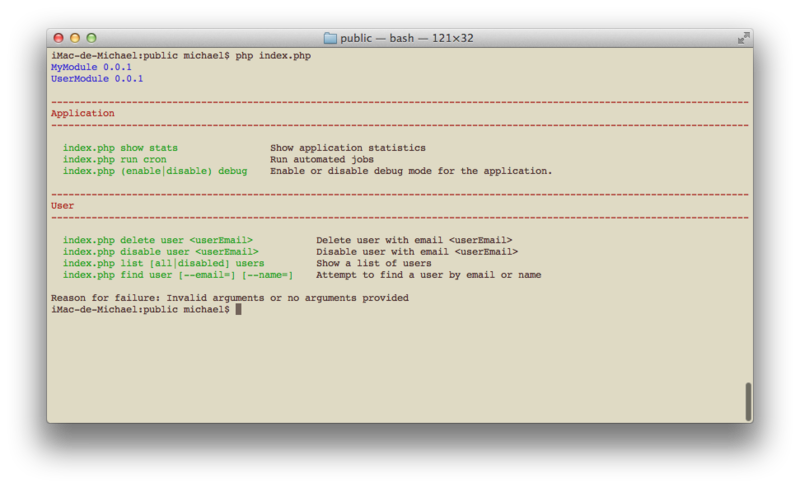 zend-mvc integrates with zend-console; the integration also works with modules loaded with the Module Manager. arguments could not be matched by any routes. The strategy currently supports two types of information: application banners and usage information. As you can see, the application banner should be a single line string that returns the module's name and (if available) its current version. If several modules define their own banner, they are displayed one after the other in the order in which the modules are loaded. 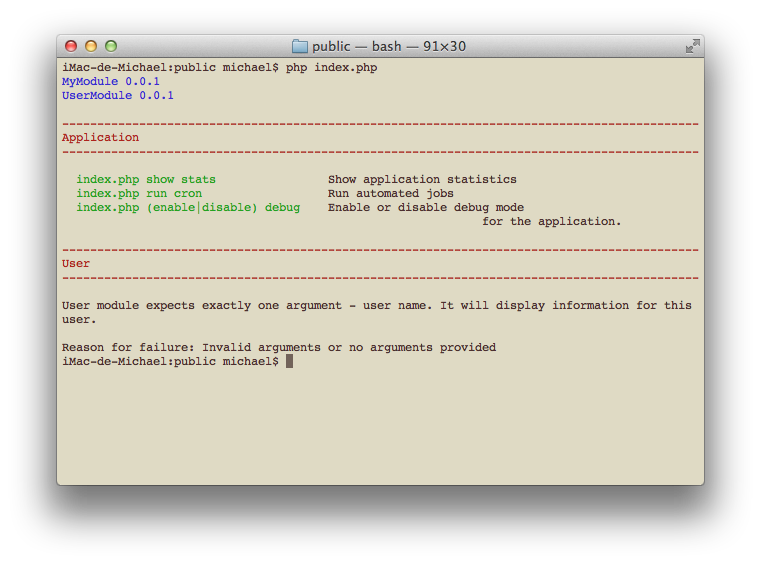 This allows you to see at a glance which modules expose console commands. Application banners provided by modules are displayed as-is — no trimming or other adjustments will be performed on the text. As you can see, banners are also automatically colorized as blue. Similar to application banners, multiple modules can provide usage information, which will be joined together and displayed to the user. The order in which usage information is displayed is the order in which modules are loaded. As you can see, the zend-mvc integration also prepends each module's usage with the module's name. This helps to visually separate commands by module — which is particularly useful when you have multiple modules providing commands. By default, the component colorizes the module names in red. Usage info provided in modules is not connected with console routing. You can describe console usage in any form you prefer, and it does not affect how MVC handles console commands. In order to handle real console requests, you still need to define console routes. The text provided is displayed as-is; no trimming or other adjustments will be performed. If you'd like to fit your usage information inside the console window, you could check its width with $console-getWidth(). If getConsoleUsage() returns an associative array, it will be automatically aligned in 2 columns. 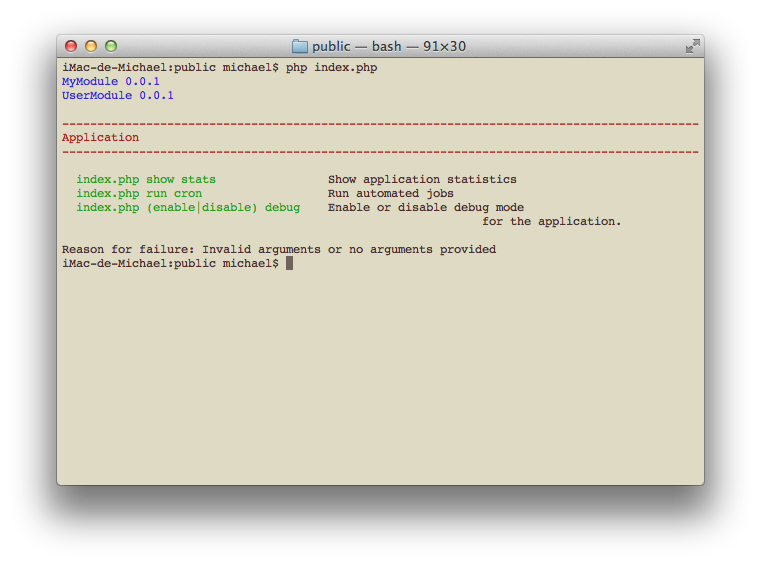 The first column will be prepended with script name (the entry point for the application). This is useful to display the various commands exposed. 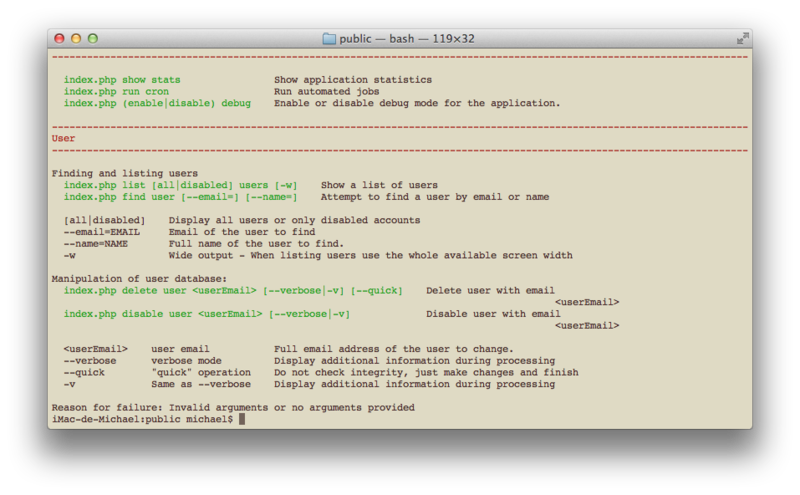 Commands and their descriptions will be aligned in two columns that fit inside the terminal window. If the window is resized, text may wrap, but all content will be aligned. If you don't like the behavior, you can always return free-form text instead, as free-form text is never transformed or aligned. All information will be aligned in one or more columns that fit inside the terminal window. If the window is resized, some text may wrap, but all content will remain aligned. In case the number of columns changes (e.g. the array contains different number of elements), a new table will be created, with its own alignment and column widths. If you don't like this behavior, you can always return free-form text. You can use mix together all of the above styles to provide comprehensive usage information. Your module's getConsoleBanner() method should return a one-line string containing the module's name and its version (if available); do not provide any other information. Your getConsoleUsage() method should not return the module's name, as it is prepended automatically for you by the zend-mvc integration.